all I want is my clock, weather and possibly music/pandora for my kitchen. or does anyone know of a similar device that has what I listed above? hopefully my usb works. need to try after i get a usb drive. same plus the alarm, as i use it on my night stand. Thanks! This worked and I really though this was the end of my favorite alarm clock ever! Now to get the replacement software out ASAP! I thought it was a Firefly (or, rather, "Serentity") reference. The Hero of Canton, the Man They Call Duane! It is a Serenity quote, but Mr. Universe was killed and his "wife" was a robot. On a USB I place the update.zip file (zipped) and the recently uploaded unbrick file unzipped with its files copied on the top level (USB now contains the two zip files as well as the 7 files from the unbrick file. I insert the USB without, then plug the dash and hold the menu button util the setup screen shows with he dots going across. Then I get to the setup screen which says network, install updates and cancel. Then it automatically goes grey and says rebooting. Once it's finished I will have the flashing SONy sign on the bottom. Sounds like you are reflashing with 1.7.1604, not 1.7.1526. What is the size of the update.zip file? It should be 101776156 bytes. Thanks for the scripts. My Sony Brick is up and running again. I had to use the oldest thumb drive I could find. Two fairly new ones were not recognised. BTW, I also tried restoring to factory defaults before trying .1604 for a second time, but it bricked the Dash again. I'm looking forward to a Chumbytised version of firmware. The only file I can find to download has a size of 105,940,027. That is the one found on reddit. Where are you guys getting the one with the 101776156 size? I have 3 dash's that are now unbricked. I really appreciate Duane doing this. I don't think I will every buy another Sony product after the douchey way they handled this. Thanks much! Thanks for the fix. I found an earlier version of Update.zip. I unbricked the brick. But, I would like to try it with version 1.7.1526. I know it exists somewhere on the net. Could someone stear mew in that direction? I have unplugged both of my beloved Dashes until there is a functional upgrade. I did have Pandora for 6 minutes before I got the mandatory upgrade message. There is hope. There's a post in the stickied posts at the top of this forum with a pointer to a reddit post that has the proper, unmodified update. * The "Special Options" mode UI will appear very briefly, then the USB update will begin. The "Special Options" UI appeared on screen and stayed there until I selected "install updates" and "install from USB", it didn't appear very briefly then proceed with the update on its own. It stayed stable for about 24 hours, then as soon as I started using 1 or 2 of the apps, the pop-up appeared. Can I make the fix a little more permanent? Why does the sony site say the update is only for the C10? Also, are beginners first posts moderated? My other post disappeared. Anyways, what I said in the disappearing post was I am looking forward to the Chumby for Dash update and thanks to those involved in making it happen. Can I make the fix a little more permanent? The fix simply rolls the firmware back to a working version, it doesn't change anything. We suggest unplugging the Dash until we have our alternative ready. (which should be soon). Okay, I will do. I wasn't clear on exactly what the fix was meant to accomplish. Thanks for the advice and all the hard work! Good Stuff. After reboot, I have my weather forecaster which describes the cities from home to Sanibel. Waiting for further fixes to take over the world. The 1526 update from last year was only for C10 units since the new models didn't need it. There was a problem that evidently only effected C10 units. B7 and B70 units were not effected by the glitch. If I understand it properly, Duane's fix *will not* necessarily fix the b7-b70 units since technically they will not have the 1526 update and Duane has (at least at this point) made a fix that works with 1526. He will need to make a pronouncement about this at some point. It seems that he did have some success with working out something with the newer models but I can't remember how that worked out. He is focusing on Saving the Dash (c-10) and then I am sure he will do what he can with comes after that. So I got the update with with "ok" button and no other options. I updated and the c10 went into the night clock mode so I used the update.zip and rolled it back and did not use an internet connection. I have full functionality except it is not connected and thus no weather, etc. Here is my question: in the update.zip file(s) is it possible to allow the c10 to connect to the internet without trying to update by modifying any of the files and prevent the device from updating while still allowing network connection? If it is connected to the interwebs it'll get that update notice pushed to it again. The 'update.zip' described here is to repair damage the Sony update does and get "bricked" units back to a condition where they can take the upcoming Chumbification. It's hard to do but please do not allow your Dash to connect to the Internet until after the Blue Octy software is installed. I just unplugged mine for the time being. We don't advise doing that. Please be patient, we'll get you a patch that works, soon. Thank you! It works. I have my clock (and alarm) back. It's kinda bright but better than nothing. Thanks for the 'unbrick' fix a few days back and to all the people who have added their input on this thread. My c10 had been doing the flashing Sony logo thing post-update to 1604... I'd be semi-ok with the update IF Sony's firmware had actually worked as advertised (maybe Sony will release a properly tested firmware that actually makes the device a functional clock/alarm)? Anyhow for the time being I rolled back to 1526, joined the network, authenticated, pulled down control panel stuff, got the update notice, pulled power, plugged-in power while holding Vol+ to skip update, got to control panel and quickly blocked the device/static IP on my router from reaching the internet. The device has an IP, but can't chat with the Sony servers to say it doesn't have the latest firmware...so no more update notice. I had a Dash clock app and have made that full screen...all has been good for a couple of days. 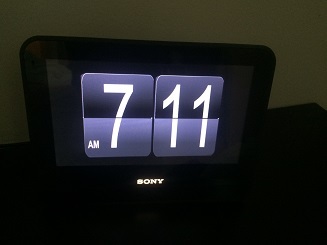 All I have at this time is a clock that does not remind me that I am not connected to a network...which is better than a $200 single purpose "ad" device that not only advertises Sony to me on the screen but also with a bonus flashing Sony logo to boot. The clock function will do...until the device becomes a Chumby.